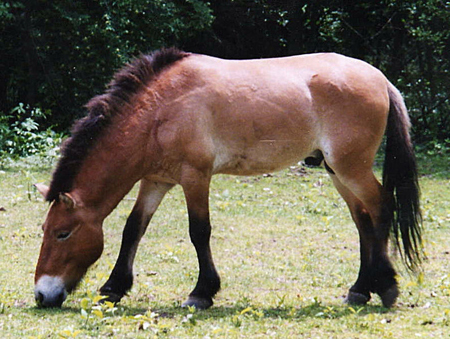 There is strong evidence that the first domesticated horses were corralled more than five thousand years ago by people in the vicinity of Krasnyi Yar, on the steppes of what is now northern Kazakhstan. So far, there is no indication that these people, the Botai, actually rode their horses, but there is plenty of proof that they ate them. An archeological dig there has surrendered a great many horse bones with knife marks and other evidence of this. Current thinking is that horses were herded and fostered for both milk and meat. Researchers have discovered fence posts, manure, and evidence of leatherwork, including rawhide. The Iberian Peninsula (Spain and Portugal) has fostered and bred horses for millennia. Through the Conquistadors, the animal was reintroduced to North America (specifically the West Indies) during the second Columbus voyage, in 1493. Cortez first brought them to the mainland in 1519. Over the next three centuries the feral population increased as horses were released to forage, and escaped. These ‘mustangs’ were described in Spanish as mestengo, which in essence can be translated as ‘stray’. Native Americans began to catch these animals and use them to hunt and carry burdens. By the advent of the cowboys, there were an estimated two million feral horses on the continent. The intentional introduction of thoroughbred blood into these herds by ranchers in Mexico (and later in what would become the United States) is thought to have in part led to the development of the cowboys’ favorite mount, the American quarter horse. Named for its ability to sprint over short distances (specifically, a quarter mile), the horse is ideally suited to working cattle.Some North American tribes, especially the Nez Percé (Nimipu), practiced selective breeding after they captured wild mustangs. Based in and around north-central Idaho, the tribe developed the Appaloosa breed, which is named after the Palouse River that runs through their territory. This magnificent lady’s portrait is courtesy of the Dickinson Cattle Co. of Barnesville, Ohio. She is a red and white Texas Longhorn named Win Jubilee. 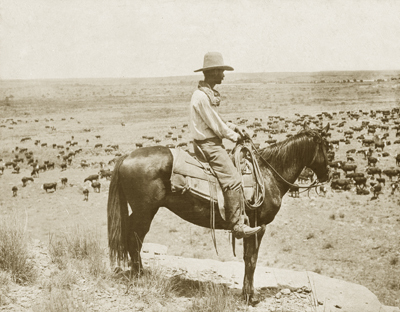 Horses were essential to cowboys, but they would have been pointless without cows to herd. From a small group that was domesticated c.8500 BC in southeast Turkey (where it borders both Iran and Iraq), bovine numbers have grown to about 1.5 billion worldwide today. The United States is home to just under one hundred million cows (dairy and beef). Some of them are descended from English and Scottish breeds such as shorthorns and Angus, or European dairy breeds such as the Fresian and Holstein. 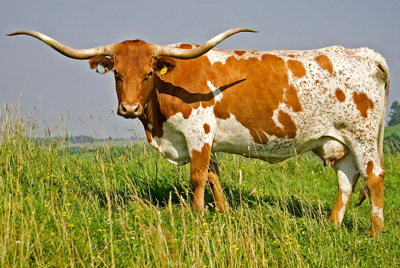 A very few are descended from Texas Longhorns, but 150 years ago, that was not the case. When Columbus brought horses to the West Indies in 1493, he also brought a strain of cattle that were hardy, self-sufficient and independent. These Longhorns, another product of the Iberian Peninsula, have been genetically traced to two ancient lineages of aurochs, which are relics of the Pleistocene epoch. Aurochs (bos primigenius) looked like 2,000 lb. oxen and they played a major role in European cuisine for a very long time: their images have been found in ancient cave art, yet the last of them survived all the way up until 1627 AD. Longhorn genetic code reveals descendent genes that come primarily from aurochs in the Middle East, with a trace root in India. Their ancestors were familiar with foraging in arid wilderness, and surviving on infrequent water sources, so they were well suited to many parts of Mexico. By the seventeenth century, Spanish ranchers had introduced the cattle in what is now Texas, where they thrived. Over the next two centuries, thousands of these Iberian bovines escaped from domestication and became a feral species. In the early nineteenth century, Texas cattlemen began breeding them to domestic cows imported from New England and the Eastern seaboard. The result was a rangy, resistant, self-reliant breed with horns long enough to defend against most natural predators, or to forage through mesquite, cactus and sagebrush to find sustenance. The colors of the new breed reflected the diverse origins of the eastern cattle, spanning the palette from red to blue. By the end of the Civil War, there were somewhere between three and five million feral cattle in Texas (estimates vary widely). Newly unemployed soldiers from both armies ambled west for adventure and sometimes anonymity, and then looked north to Chicago and the burgeoning cities of the industrial belt for a market. There were no railroads on the open plains yet. These hardy, war-worn veterans were used to living under the stars, riding all day and defending themselves with firearms. They were ideally suited to the task of rounding up wild cattle and escorting them to the nearest railhead in Sedalia, Missouri. Railway executives saw the potential for profit and soon extended lines to Dodge City, Abilene, Wichita and other towns that had until then been themselves the very frontier. The country, exhausted by war and destruction, relished the image of these brave men facing rattlesnakes and wolves, tornadoes and bandits, and coming through it all with their herds intact to feed a newly united nation. The dashing picture painted by the media was of independence and swagger, a modern version of the legendary swashbuckler. The cowboys seemed to embody some core values of the healing nation – strength, purpose, courage, hard work and adventure. It’s important to place the cowboy in context. 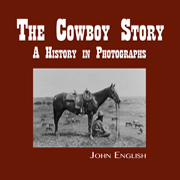 He was not the gun-slinging outlaw of Hollywood Westerns, nor the Indian-fighting Cavalryman. He wasn’t a sharpshooting gambler like Doc Holliday, or a lawman, or even a rancher. He was, for the most part, a responsible, extremely hard-working young man who watched over cattle and horses, doctoring and feeding them while protecting them from wild predators, natural disasters, and rustling thieves. The vast, vast majority of cowboys never pointed their gun at another person. Most of them were too busy to get in trouble. They let off steam when they hit town after a long trail drive, but for the most part they didn’t shoot up towns or ride through the streets or terrify the townsfolk. Cows weren’t the only animals being herded in the late 1800s. For more than half a century, Belle Fourche in the Dakota Territory shipped more beef and sheep than anywhere else in the country. 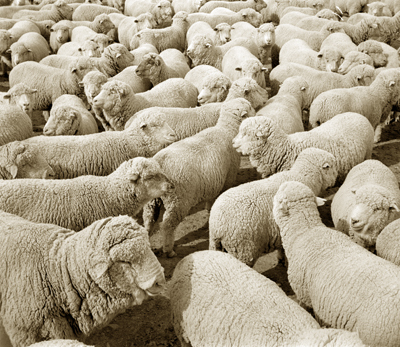 At its peak in the 1950s, the sheep population in the US numbered more than fifty million animals. There was animosity between cowboys and sheepherders, and it often erupted into violence. The bone of contention was usually grazing rights, especially in Texas, Arizona, Colorado and Wyoming. Sheepherders sometimes moved their flocks across the plains in search of new grass. They often cut fences on public land, and sometimes even on newly private property that had traditionally been public grazing. Sheep also introduced psoroptic mange (sheep scab), which is a highly infectious form of mite. These little critters would brush off on rocks, fence-posts and other objects that were used by sheep to scratch an itch, and then transfer to cattle. The disease causes hair loss, attacks the immune system, and opens the way for other infections to occur. Armed conflict between sheep and cattle outfits continued from the 1870s until well into the twentieth century. The last event occurred in Colorado in 1920, when 150 sheep were killed in the White River National Forest because they were grazing on what cowboys believed was beef territory. But by then, there was very little public grass that was still open rangeland, so the reasons for fighting had essentially dissolved over time. 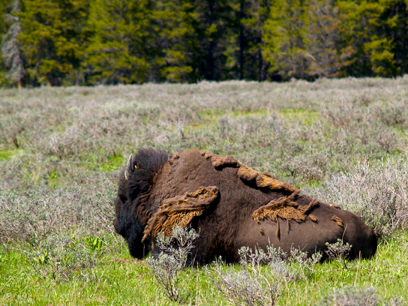 Aside from sheep, the other big grazers on the Western plains were bison. Warfare between European settlers and indigenous tribes had been happening since before 1776, but it accelerated after General Custer’s expedition found gold in the Black Hills in 1874. The presence of the Cavalry and a belief in Manifest Destiny encouraged what became one of the greatest land grabs in history. Within a mere twenty-five years of the Little Big Horn (1876), white settlement had dispossessed the Lakota and their neighbors in what are now North and South Dakota, Montana, Wyoming and parts of Nebraska. While military might accounted for some of the impact, the real key to the annihilation of the indigenous lifestyle was the removal of the primary food source, buffalo (American bison). Eliminating the species not only reduced the enemy to starvation, it also took away much of his clothing, utensils, art, social structure, religion and, most importantly, fighting spirit. Nomadic tribes that had followed Tatanka (the Lakota word for bison) for some 9,000 years across the northern plains were quickly reduced to waiting in line for a meager beef allowance doled out by the federal government. It was a tactically brilliant and yet socially tragic strategy, for in its ignorance and cruelty it not only reduced the bison to a handful of breeding stock, it also reduced the surviving Native population to reservation life. The void created by the loss of the bison was quickly filled by another nomadic culture. Cowboys rarely stood still. They worked long trails that crisscrossed a continent. But they also moved from employer to employer, entering and leaving the lifestyle in remarkable numbers. Riding herd in all kinds of weather is a young, single man’s calling. As youth receded, many cowboys tired of the transience, loneliness and near poverty of the plains, and longed for something more stable. Some used proficiency with firearms and their survival skills to become lawmen. Others joined the ranks of the formerly denigrated farmers, the ‘sodbusters’ who opened up the earth to crops and thereby closed it to grazing. Still others joined related trades such as saddle makers and muleskinners, while the more ambitious staked out their own little patch of prairie and became ranchers. A few discovered theater. By the end of the epoch, professional rodeo was beginning to gain ground, and the Wild West shows of characters such as Buffalo Bill Cody and Pawnee Bill (Gordon Lillie) employed a few cowhands. But their heyday was only a single generation, and even though they still work cattle everywhere from St. Louis to Seattle, cowboys lost a little glitter when they hung up their six-guns early in the new century.